Entries have been somewhat sporadic over the last week as I have been distracted by other things. Planning for a backpack trip over the August Bank Holiday, a couple of days walking, work as Chairman of the local community trust, oh….. and work! Even so, I have had plenty of time whilst out walking to think of new features or posts for Munro Musings. Whatever the motive of putting a blogroll or list of links on your blog, I often wonder why did they include that particular website? What makes that website useful or interesting to the author? The Click It! feature will do exactly that, give my reasons for including it on my site, why I find the site useful, interesting or engaging. Why the site stands out from the myriad of outdoor and walking blogs and websites that compete to hold our attention. So keep your eye out, the first Click It! recommended site will be revealed later today. Could it be your site? Purists may argue that driving your car to the Mamore Lodge Hotel and starting your walk at 200m is cheating. Instead they would advocate starting in the village and climbing through the woods beside the Grey Mares waterfall up to the land rover track heading for Loch Eilde Mor. Let the purists argue that if they wish, I however will continue to make use of the car park at the Mamore Lodge for my forays into the Mamore range of mountains. All of these mountains have a long approach and starting from the village needlessly extends these approaches. So ignoring the purists I set off on a warm, sunny day along the land rover track skirting around the edge of the Stalkers Cottage before head up Coire na Ba. This is local territory for me, I can see the beginning of the coire from my living room window with the double summits of Na Gruagaichean towering above. 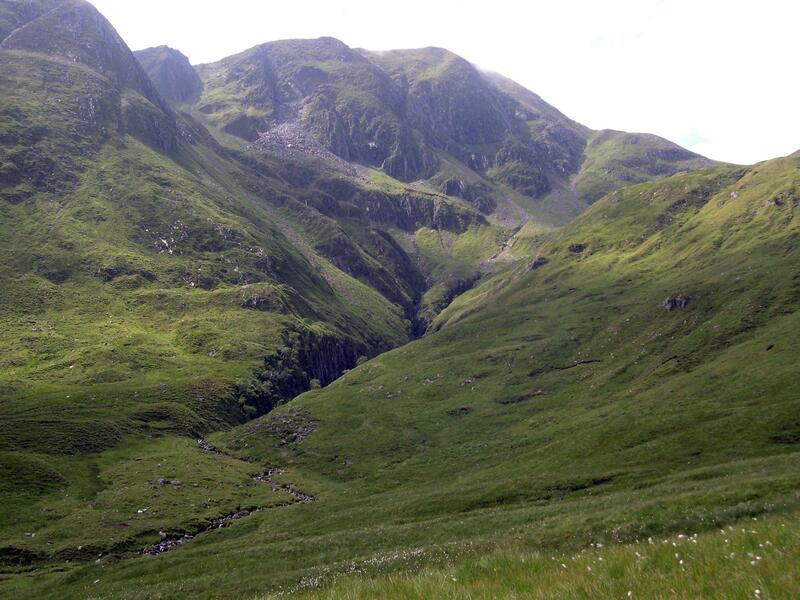 The coire is a large bowl with the crags of Am Bodach on one side and the slopes of Na Gruagaichean on the other, at its head the pyramid of Stob Coire a’Chairn. Many days are spent looking out the window longing to be walking along the path that takes you all the way to the ridge line. Once on the ridge you are treated with a panorama of some of greatest mountains starting with Ben Nevis and stretching across the Aonachs and then on to the fine ridge of the Grey Corries. I skirted around the back of Stob Coire a’Chairn to a small col and the path that heads up the steep and rocky slope of An Garbhanach where the fun starts. Barely 400m long this airy, exposed ridge provides a fine scramble for hill walkers. For those of a gentler persuasion you are able to bypass the scrambling by following a path, but in one place I found this to be equally exposed with a tricky steep section on loose gravel and rock. On my return along the ridge I stuck to the scrambling with no particular problems. At the summit of An Gearanach you can savour the Glen Nevis vista before you over your sandwiches and flask of tea. The path continues down the northern ridge into the glen and the wire bridge at Steall, this makes a fine through route from Kinlochleven. However, I returned to the main Mamore ridge and headed up the scree slopes towards Na Gruagaichean, on first ascent you are deceived by thinking you are nearing the summit only to find it is a minor top and you still have a small dip to negotiate before reaching the true summit. This small dip is indeed tricky, steep and loose gravel call for gravel but once past it is an easy clamber up and over large rocks to the summit. Here another panorama is before you, to the east the shimmering Loch Eilde Mor and Blackwater reservoir with the bleak Rannoch Moor. Then to the west Loch Leven stretches out bathed in early evening sunlight framed by the Pap of Glencoe and Man na Gualainn with the Morvern hills beyond. You can backtrack to the col and the Coire na Ba path or continue down the southern ridge, as I did, to meet the land rover track that will lead you back to the Mamore Lodge much to the purists disgust! The deer stalking season started on the 1st July and although few estates begin to stalk that early many will be commencing at the beginning of August. I picked up a handy pocket guide this morning produced by Scottish Natural Heritage that outlines the main stalking areas covered by the excellent hillphones service. During the season you can phone up and listen to a recorded telephone message that will indicate when and where stalking will be taking place in a particular area, as well as giving a forecast of activity over the next few days. Generally the advice normally given is to stick to the main hillpaths, prominent ridges and main routes through the glens. I have never had any problems during the stalking season, much of the advise is common sense, but I would recommend using the hillphone service if you are in any doubt. I set out with the aim of writing not only about munro bagging but also about Kinlochleven and the surrounding Lochaber area on this blog. Since its creation I have failed to mention the latter in any detail, instead concentrating on recent munro walking. To address the balance a bit I thought I would highlight some of the walking opportunities around the village by posting a local walking leaflet. This was produced by the village trust some time ago following the closure of the local Aluminium Smelter. I am the new Chairman of the community trust and one of our priorities is to review and regenerate the path network in and around the village. That is a mammoth task that will involve working with other landowners as well as applying for outside grants. We are determined to make a difference and attract more walkers to this great area. An early task will be to update information about walks in the area and expand this to include some higher level walking guides as well. I am sure I will post more information on this project as it develops. In the meantime take a look at the leaflet, it is primarily aimed at casual walkers looking for undemanding lower level walks but it does give a flavour of what is on offer. I have been searching for blog client software that will allow me to write blog entries offline and easily upload them later. I think I have now done so with this program. This is a test post using it. Please ignore.